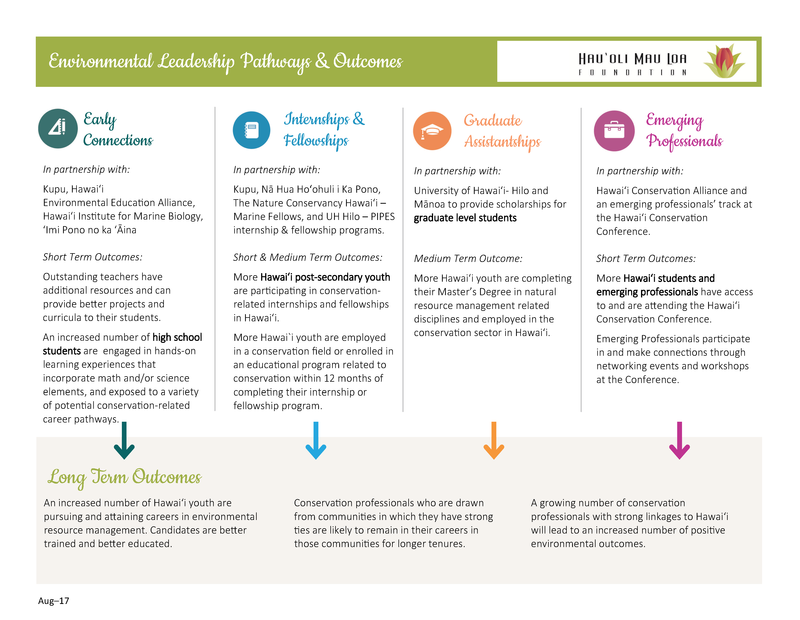 The Foundation’s mission includes promoting stewardship, preservation and protection of the natural environment. As a way of carrying out this mission we have partnered with organizations in Hawaiʻi and internationally. Internationally, we have partnered with Global Greengrants Fund, an organization that makes small grants to grassroots groups in developing regions around the globe for conservation efforts. Invasive Species Prevention in the State of Hawaiʻi– The Foundation has partnered with the Coordinating Group on Alien Pest Species (CGAPS) since 2011 and has provided support for numerous prevention projects and key CGAPS staff. Our plan is to support projects identified in the CGAPS strategic plan that have been selected as priorities by the CGAPS steering committee. Environmental Leadership Pathways (ELP): Developing the Next Generation of Environmental Resource Professionals in Hawaiʻi– We believe that the long-term effectiveness of environmental conservation work and organizations in Hawaiʻi depends upon a new generation of environmental resource managers who mirror the local demographic and come from the communities in which conservation work is needed or taking place. 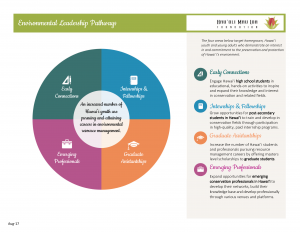 The Foundation has partnered with key Hawaiʻi-based organizations (noted below with “ELP” after their name) that engage and prepare the next generation of environmental leaders in Hawaiʻi. 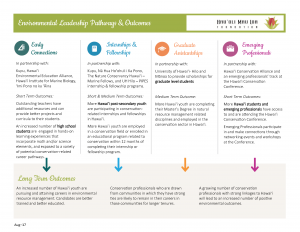 You can learn more about our overall Hawaiʻi environmental program strategy development here: Environmental Program Overview and about Environmental Leadership Pathways by viewing the graphics below.